At #9 in our countdown of the Top 15 NHL Teams of All Time, we bring you the 2001-2002 Detroit Red Wings. On paper, many people consider this to be the greatest collection of Hall of Famers ever put together, up there with the 92-93 Penguins and the Oilers of the 80’s. Steve Yzerman. Brendan Shanahan. Sergei Fedorov. Brett Hull. Luc Robitaille. Nicklas Lidstrom. Igor Larionov. Chris Chelios. Dominik Hasek. Hell, that lineup reads like something out of a video game. We’ll take a deeper look at this team and explore exactly what made them one of the top 15 teams of all time. The 2000-2001 season saw the #2 Red Wings get eliminated in the first round by the Los Angeles Kings in 6 games. That stunning first round defeat marked the 3rd consecutive season the Wings failed to reach the ultimate goal and panic was starting to rise in Detroit. Since 1997, the Wings had been led by their fantastic offensive trio of Steve Yzerman, Brendan Shanahan, and Sergei Fedorov. However, the 2000-2001 saw those three only combine for 81 goals and 197 points, much less than what Wings fans were accustomed to in the past. Fedorov was 31 and seemed to be past his Hart Trophy days. Brendan Shanahan, after making a huge impact by scoring 46 goals in his first season with the Wings in 96-97, had seen his goal totals dip from that high of 46 down to 31 in 00-01. Steve Yzerman, their Captain, their savior, was 35 years old, missed 28 games, and he recorded his lowest point total since the lockout shortened 94-95 season. 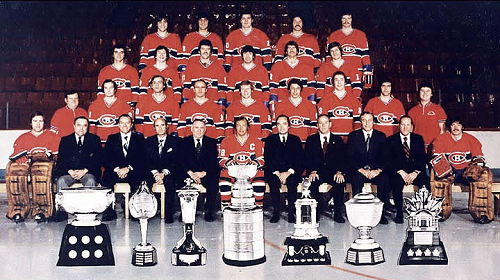 Many feared that the Wings were washed up and no longer had the ability to compete for the Cup. General Manager Ken Holland sensed this and knew he had to make a big splash in the offseason. Holland decided to bring in Hall of Famers Dominik Hasek, Brett Hull, and Luc Robitaille. While no longer in their primes, all three still had the capabilities to make significant contributions. Hull, the legendary sniper, had scored 39 goals the previous year. Robitaille, one of the greatest Left Wingers of all time had scored 37 goals the previous season. And finally, Dominik Hasek, one of the most acrobatic and exciting goaltenders of all time, posted 37 wins, 11 shutouts, a 2.11 GAA, and a .921 SV% in 2000-2001. The Red Wings were once again reloaded and ready to roll for the new season. The Red Wings started the season on fire, starting an incredible 22-3-1-1. Just 2 months into the season, the Red Wings led the Western Conference by 10 points, and led their division by a whopping 15 points. However, the Wings cooled off a bit as they lost 5 of their next 7 to fall back to the pack a bit at 23-8-2-1. But the talent level on this team was too high to be kept down for too long. The Wings ramped right back up, going 9-0-2-1 over their next 12 games to push their record right back up to 32-8-4-2. 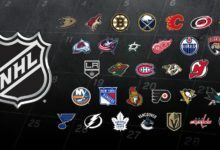 At this point in the season, the Wings led their division and the conference by 8 points and were the only team left in the NHL with single digit regular season losses. Instead of running to the All-Star break, this season had the Olympics in Salt Lake City, so there was a 2 week break in the middle of February. Heading into that Olympic Break, the Wings were 41-11-6-2, led their division, conference, and league by 15 points, and were light years ahead of the rest of the NHL. However, one of the biggest questions heading into the Olympics was the age of the Red Wings. 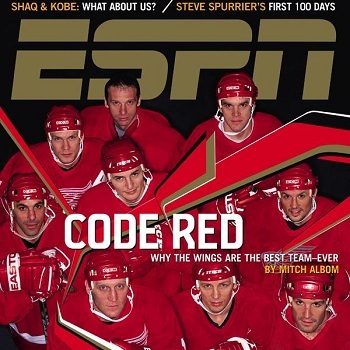 The Wings had 11 players playing in the Olympics (Canada – Shanahan, Yzerman; USA – Chelios, Hull; Czech Republic – Hasek; Russia – Fedorov, Datsyuk, Larionov; Sweden – Lidstrom, Holmstrom, Olausson), and many felt that the Wings would be too worn out to compete hard in the playoffs. Those that had those sentiments could not have felt more right. From the Olympic Break to the end of the regular season, the Red Wings went just 10-6-4-2, including going 0-3-2-2 in their final 7 games. The Wings still won the President’s Trophy and finished with an outstanding 116 points, but many were concerned about this team heading into the playoffs. Their first round opponent was the Vancouver Canucks. The Canucks were one of the hottest teams down the stretch, going 8-0-1-0 in their final 9 games and winning 13 of their final 16 games. The Canucks were led by their fantastic top line of Markus Naslund, Todd Bertuzzi, and Brendan Morrison. The “West Coast Express” as they were famously nicknamed, combined for 99 goals and 242 goals in the regular season and were one of the toughest lines to stop. The Canucks immediately jumped on the Wings, taking Games 1 and 2 in Detroit. The Wings and their fans were stunned. After posting one of the most impressive regular seasons in NHL history, the Wings were down 2-0 and had been outplayed by the younger Canucks. The Canucks goaltender Dan Cloutier had stymied the Wings thus far, stopping 66 of the 71 shots he faced. Heading to Vancouver, the Wings were on the ropes. However, this is where the Wings great leader, Steve Yzerman stepped in and rallied his troops. Despite being crippled by a debilitating right knee injury, Yzerman did everything he could to lead his team. On the plane flight to Vancouver, Yzerman told his team, we are going there to win 2 games, and he backed up those words. Also one big break contributed to the turn in the series. As the 2nd period wound down in a 1-1 game, Nick Lidstrom blasted a slapshot from center ice past Cloutier and the series was never the same. Yzerman later netted the game winning goal and the Wings took Game 3 by a final of 3-1. Games 4, 5 and 6 were won by the Wings by a combined score of 14-6. The Wings were moving on to the 2nd round. The 2nd round saw the Wings meet their division rivals, the St. Louis Blues. The Blues were led by their defensive unit, anchored by Chris Pronger and Al MacInnis, as well as timely offense, contributed by Pavol Demitra, Keith Tkachuk, and Doug Weight. However, this Blues team was no match for the Red Wings. The Wings took Games 1 and 2 by scores of 2-0 and 3-2 respectively. The Blues attempted to rally by taking Game 3 6-1, but this Wings team was too veteran to be rattled by one shellacking. Game 4 saw the Blues captain Chris Pronger leave the game after tearing his ACL and all hope the Blues had was lost. The Blues went on to lose Game 4 4-3 and then got blown out 4-0 in Game 5. This series showed how dominant the Wings could be when they had their A game, and their next opponent was going to require just that level of play. After the Avs defeated the Sharks, the hockey world got the matchup it wanted. Wings-Avs. The heated rivalry that had so much hatred between it was getting renewed and both teams were loaded. Yzerman. Sakic. Fedorov. Forsberg. Lidstrom. Blake. 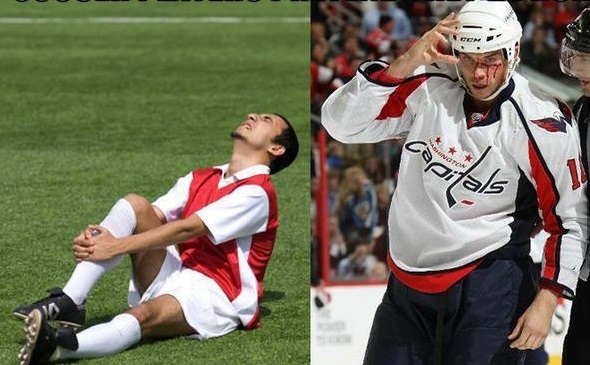 Hasek. Roy. There were Hall of Famers up and down both rosters and everybody knew that this was going to be one hell of a series. The Wings took Game 1 5-3, thanks to the surprising hat trick by Darren McCarty. McCarty scored a natural hat trick in the 3rd period to break a 2-2 tie and turn it into a 5-2 Wings lead. Game 2 saw the Avs answer, as Forsberg had a 4 point night, and Chris Drury scored the OT winner to give the Avs a 4-3 OT win and a series split heading back to Colorado. However, the Avs could not build on that momentum as they were mercilessly outplayed, getting outshot 42-21 in the game. Roy bailed out the Avs throughout the entire game and got his team to OT at 1-1. However, as had been the case throughout the entire series, another unsung player stepped up for the Wings to bury the winner. Fredrik Olausson beat Roy at 12:44 of the OT period to give the Wings the 2-1 OT win and the 2-1 series lead. Game 4 finally saw the Wings big guns wake up as Fedorov and Hull each tallied for the Wings, but once again, Patrick Roy was outstanding, and this time it was enough. Roy stopped 31 shots to backstop his team to a 3-2 win and a 2-2 series tie heading back to Detroit. The crucial Game 5 was played as such, with both teams bringing their all. Regulation was not enough as the series went to OT for the 3rd time, tied 1-1. Just 1:40 into OT, Brendan Shanahan skated down, deked Roy out of his net, but missed the empty net that would have given the Wings the 3-2 series lead. That mistake would cost the Wings as just 5 minutes later, as Forsberg beat Hasek on a breakaway for his 8th point of the series and 27th of the playoffs. The Wings were up against the wall heading back to Colorado. However, just as the Wings had gotten those crucial breaks in their previous series’ with the Nick Lidstrom center ice goal and the Chris Pronger ACL injury, the Wings would find a break in this series. In a 0-0 game with time running out in the 1st, Steve Yzerman wrapped around the net and fired a shot on Roy. Roy made a remarkable glove save and held up his glove in his famous Statue of Liberty fashion. However, Roy didn’t have the puck and Shanahan poked the puck into the empty net. Dominik Hasek turned in one of his most spectacular performances of the playoffs, robbing the Avalanche on several different occasions. The Wings held on for a 2-0 win and it set up a Game 7 that the hockey world wanted. Before that Game 7, instead of giving the traditional pregame pep talk, Scotty Bowman decided that it was more important to lighten the mood by telling jokes. Boy did that loosen up his team. The Wings lit up Patrick Roy for 4 goals in the first, and had chased him from the game by the end of the 2nd period. The Wings closed out the Avs 7-0 and punched their ticket back to the Stanley Cup Finals. 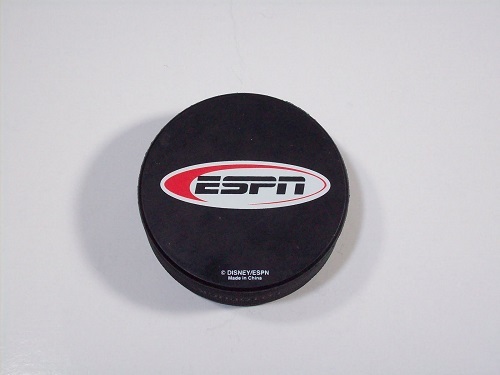 Their opponent was the Cinderalla Carolina Hurricanes. 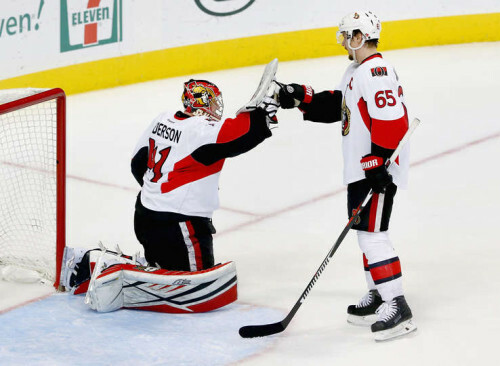 Game 1 saw the Hurricanes hang right there with the heavily favored Wings, outshooting them 26-25 and largely keeping the Wings big guns in check. The game went into overtime tied 2-2 but it didn’t stay there for too long. Just 58 seconds into OT, Ron Francis beat Dominik Hasek to give the Hurricanes a shocking 3-2 win in Detroit. Game 2 all of a sudden became crucial for the Wings and they responded as such. However, heading into the 3rd period of Game 2, the Wings and Hurricanes were locked in a 1-1 tie despite Detroit being far more dominant. The third period saw the Wings rediscover their elite level as in a span of 13 seconds, the Wings tallied twice to take a 3-1 lead. The series was tied 1-1 heading back to Carolina. Game 3 saw the Wings carry on that elite level of play, but Carolina goalie Arturs Irbe continued to stymie the Wings and he carried his team to overtime. This game seemed like it would never end as OT stretched into double OT which then stretched into triple OT, where the oldest man in the NHL ended the game. Igor Larionov beat Irbe high blocker side with a backhander to end what was the 3rd longest Stanley Cup Finals game at the time. That triple OT thriller seemed to be the event that finally broke Cinderella’s dream. Game 4 was a strong 3-0 shutout (Hasek’s 6th shutout of the playoffs) for the Wings, a game where they only allowed 17 shots and stifled the Hurricanes for most of the evening. The stage was set for the Wings as they headed back to Detroit with a 3-1 series lead. Being the veteran-laden team that they were, they were not about to let this series get back to Carolina. The Wings started very fast, throwing everything on net against Irbe, but the Wings just could not get one past him in the first period. However, early in the 2nd, the Red Wings onslaught finally led to a goal. Tomas Holmstrom jumped into the slot and tipped in an Igor Larionov pass. Brendan Shanahan added another goal later in the period, but the Canes would not go away. With time running down in the second period, Jeff O’Neill finally broke Hasek’s shutout streak at 166 minutes and pulled the Canes to within 1. However, this Wings team was built for one purpose – to win the Stanley Cup and they were not going to led any amount of adversity stop them. The Wings kept coming and coming and coming in the 3rd period. Finally, with the Canes running out of time, they pulled Irbe and Shanahan buried his 2nd goal of the night into the empty net and bedlam ensued. This Wings team was special for many reasons. It involved a lot of exceptionally talented, star-studded players coming together and making the necessary sacrifices required in order to win the Stanley Cup. It meant guys like Luc Robitaille, the highest scoring LW in the history of the NHL going from 20+ minutes a game down to the 3rd line and only 13 minutes a game. It meant guys like Yzerman and Lidstrom taking pay cuts in order to bring Brett Hull into the fold. This team was special in so many ways, but the coming together and blending of talent stands out amongst everything else and truly makes this team one of the greatest of all time. The only thing preventing this team from being higher in our rankings is the fact that they were prone to stretches of games where they seemed uninterested or unfocused and their age was definitely a detriment in a more physical series. However, they put it all together for one year to win Lord Stanley’s Cup.